Title Card: Fate sometimes lurks in Christmas shopping. 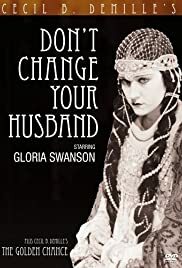 The film "Don't Change Your Husband" Starring Gloria Swanson and Directed by award winning director Cecil Demille was overall a pretty fun film with twists thrown in there to keep things interesting. The film revolves around Leila Porter (Gloria Swanson's character) and how she basically got sick of her husband James resulting in divorce, she thought that once she was a away from him she would be much happier with another man but thing's didn't turn out the way she would have liked them to. She moves on to marry another man and sure enough things didn't go as exactly planned when she realizes that he's much worse than her original husband - hence the title "Don't Change Your Husband." It's just a fun film with a somewhat shallow plot but fun nonetheless, the story line keeps you interested and although it is a silent film it's still worth seeing at least once, not that there's anything wrong with a good silent film. Great Actors and Great Story line.